In just a few days, people will be staring a leftover turkey and wondering about what to make with the Thanksgiving remains. One of my favorite things to do with turkey is make a Kentucky Hot Brown sandwich. 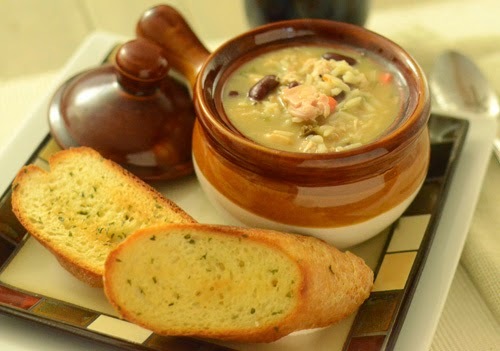 This soup is a close second for us. 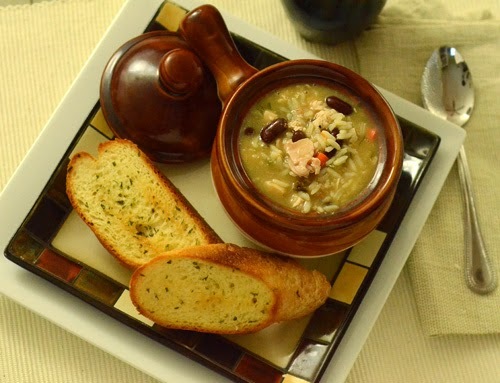 It puts a Louisiana spin on the wild rice and turkey soup that my mom made when I was younger. I know for Cajun I should have just stuck with the Trinity (peppers, onion, celery) and skipped the carrot but I like carrots in soup. Preheat a stock pan over medium high heat and melt butter. Sauté veggies for 5 minutes, until starting to turn tender. Season with a few pinches of salt and pepper while sauteing. Sprinkle in the flour and stir until blended into a light roux (about 1-3 minutes). Whisk in 1-2 cups of water gradually while constantly whisking until the roux is well combined into the liquid. Stir in the rest of the water and add the bouillon cubes. Bring to a boil, reduce heat and simmer for 45 minutes. Add the turkey, kidney beans, rice, thyme and oregano and let simmer for 25 minutes longer. Taste for seasoning and add salt and pepper as needed. 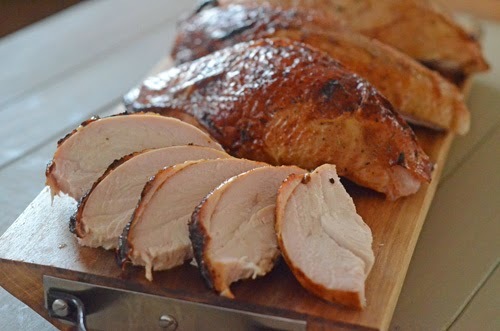 Our daughter's family can't make it to Knoxville this week, so I smoked a pair of turkey breasts yesterday to overnight down to her. I brined them in my orange and bourbon brine overnight. The seasoning was Chris Lilly's poultry rub that I had ground finely. 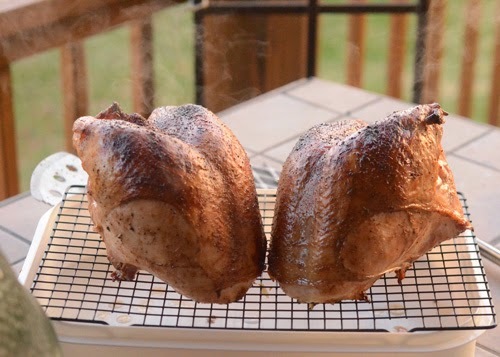 I smoked them on my Egg using coal and sugar maple wood chips that I got from Larry at Big Dude's Eclectic Ramblings. The cooking temp was 325f with an indirect set up. I did put liquid in the drip pan, not for moisture, the Egg stays plenty moist. But the liquid does keep the drippings from burning and creating acrid smoke like poultry does often. Once they hit an internal temp of 100f, I basted them with a mix of melted butter, white wine and agave nectar. 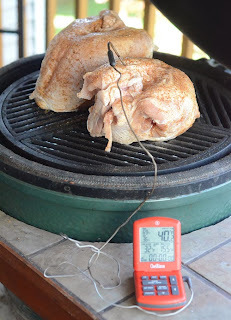 I had my Thermoworks ChefAlarm set to go off at 155f and I wanted to pull the breasts out of the cooker at 157f. 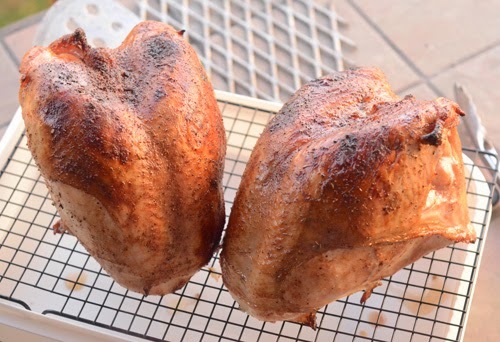 I cut off the breast halves and sliced them and cooled them down to 40f as fast as I could. Then we vacuum sealed them. To ship it we are using an insulated box with frozen cool packs on bottom and top. I get perishable stuff that way all the time. After slicing off the breast halves, the two carcasses had almost 3 cups of meat that Alexis picked from them and that is what we used to make this leftover soup. This is probably my last post before Thanksgiving so I want to share what I am thankful for this year. My family and friends - for putting up with this crazy hobby of mine and supporting me. The BBQ family - I am lucky to be a part of the best group of people around. BBQ folks are the most unselfish, caring, and helpful people that you will ever meet. They will do anything they can to beat you at a competition but they will also bend over backwards to help a stranger in need. My sponsors and partners for 2013 - Johnsonville, Craycort Cast Iron Grates, McCormick, Grilling.com, Thermoworks, and Pit Barrel Cooker. I have a few changes going on for 2014 and some new sponsors coming on board, but thank these companies for their support in 2013. My readers and audience - when I first started this blog almost 5 years ago, I was just keeping track of my cooks on the grill. I never thought anyone would actually read this stuff. Thanks for humoring me. I hope you all have a Happy Thanksgiving and get to share time with your families.